I love that song / hymn of praise “Jesus Christ is alive today, I know, I know it’s true” But how can we KNOW for sure? You need to meet the Risen Saviour. On this Resurrection Sunday, I want to say, “Happy Easter: i.e. I want all of you to have an enjoyable holiday time with friends, family, children with Easter Eggs and a lovely Easter Sunday Dinner etc, but I’m looking for another word, other than Easter, because it’s not Easter we Christians are celebrating, but the Resurrected LIFE of our Lord and Saviour Jesus Christ. So I’m going to say, “Happy Resurrection Sunday” instead. Let’s share that with Each other NOW: Say to your friends and family members, “Happy Resurrection Sunday”… Let the world KNOW we’re really celebrating the fact the Jesus Christ has risen from the dead. The Traditional Greeting on Resurrection Sunday is: “Christ is Risen”, and the crowds respond with, “He has Risen indeed, Alleluia”. 1 Now, brothers, I want to remind you of the gospel I preached to you, which you received and on which you have taken your stand. Before we came to church today, we washed our faces (I hope 🙂 ). We did this to get ready to meet and greet one another. We did it to come before Jesus in worship. However, the Lord Jesus wants us to get ready in another way, to get ready for Resurrection Sunday. Luke 23:50-56, 24:1-12 (NIV) Women Get Spices and Perfume Ready. 52 Going to Pilate, he asked for Jesus’ body. 53 Then he took it down, wrapped it in linen cloth and placed it in a tomb cut in the rock, one in which no-one had yet been laid. Those women didn’t know that Jesus was alive, they thought they were going to anoint a dead body with spices and perfumes, but what a shock and wonderful surprise they were about to get. We too can get ourselves ready for Resurrection Sunday: By coming to Jesus and being forgiven and purified from all our sins. Jesus died upon that Cross so that we can be forgiven: Let’s make sure we’re smelling good for Jesus today. Confess any known sin in your life right now. Take time to do this: Perfumed and Perfect in Christ: Forgiven and Cleansed from all sin. His blood purifies us from ALL SIN. 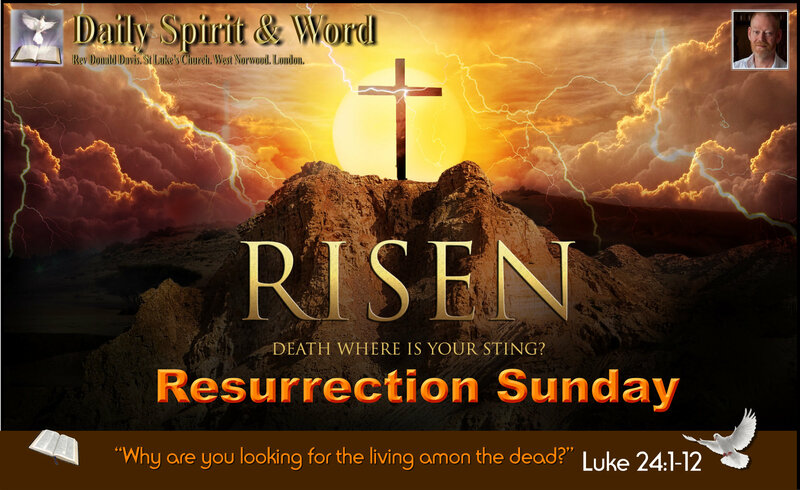 2) Getting Revelation On Resurrection Sunday: Bible Reading. Easter Eggs: Shape of a Stone: The Stone The Angels Rolled Away. 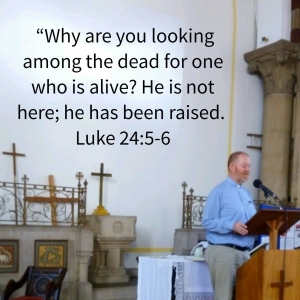 Luke 24:1-12 (NIV) Revelation For Resurrection Sunday. 2 They found the stone rolled away from the tomb, 3 but when they entered, they did not find the body of the Lord Jesus. 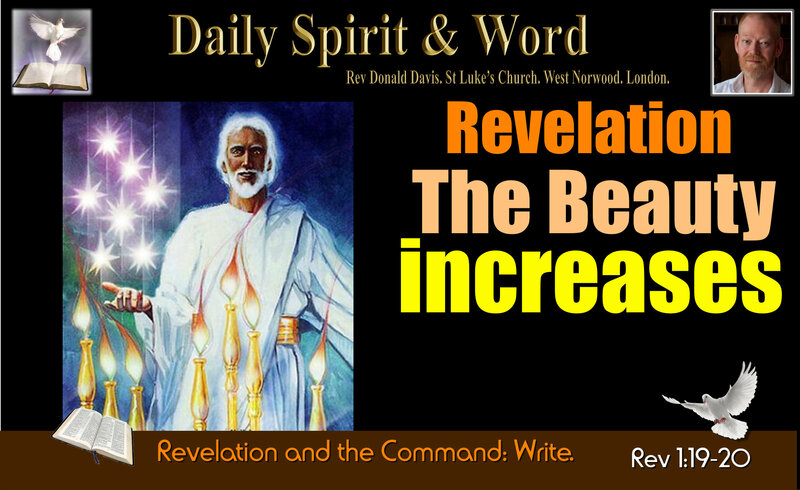 Did you get your revelation today? I got mine, because I didn’t realise that there were so many women at the tomb that day. I’ve been reading these same passages for over 30 years now, I’ve never noticed it was more than THREE… There was a crowd of ladies, we don’t know how many, but more than three. I got another revelation: In every encounter with the Resurrected Christ there’s: Revelation (He’s not dead or they meet him, the see him, they can touch him, he eats with them. Then Jesus or the Angels instruct those to whom revelation is given. Then they are commissioned: Go and Tell… WOWzer! That’s the same for you and me. 3) Getting Your Commission On Resurrection Sunday. (GO). In a few moments I’m going to say “Go” You’ll go and find some Easter Eggs hidden in the Church… But I want to say a bit more about How The Lord Commissioned Us: But I want you to see: That at each encounter with Jesus Resurrection: There’s Revelation, Physical Proof, Explanation / Instruction from the Scriptures and Commission. After the Road To Emmaus: Luke 24:13-35. Jesus shows up again. Luke 24:36-49 (NIV) Jesus Appeared, Showed hands and feet, ate, explained the Scriptures, commissioned and blessed. 42 They gave him a piece of broiled fish, 43 and he took it and ate it in their presence. 44 He said to them, “This is what I told you while I was still with you: Everything must be fulfilled that is written about me in the Law of Moses, the Prophets and the Psalms.” (The History, Writings and Poetry of Scripture Reveal Christ). NOTICE: At each of the Resurrection Appearances in Luke’s Gospel: there is first Revelation, then Explanation, then Commission. My friends, when you Come to Faith in Jesus: i.e. You know Him, that He is ALIVE. Then you get to know more about Him from the Bible, the Scriptures. Then you get to Go for Him, to tell the world: Beginning in your family, neighbourhood, area, country, world. Revelation: We KNOW Jesus is Alive. We can say, “He’s my Lord”. Explanation: Instruction in the Scriptures / Bible about Jesus and God’s Word / Commands. (Discipleship). Empowerment: New Birth from the Holy Spirit and New Life and New Power (Gifts and presence of Holy Spirit). Commission: Go and tell… Go with Jesus (He’s with you when you go in His Name)… Be obedient Go and Tell… When was the last time you share the Gospel with someone about Jesus? Excitement: When you know the Resurrected Jesus, through faith, belief, repentance and having received Him as your Lord. You’ll experience the Excitement of The Abundant Life (More than happiness, peace and joy)… John 10:10. Philemon 1:6. You’ll get a DEEPER Knowledge of all these good things we have in Christ, through sharing our faith in Him. Imagine: Charging up your Mobile Phone every day. And never turning it on to talk with someone. That’s what it’s like if you are a Christian who’s constantly getting filled with the Holy Spirit and NEVER USING your anointing to do anything good with it. When you know the Resurrected Lord Jesus Christ and have been discipled for a while, then He’s commission you too, to go and use your Holy Spirit gifts for His Kingdom Service. GO! Worship is great, but you’ll get much more, much more, much more REVELATION and ANOINTING if you use the GIFTS He’s already given to you. Share Jesus with everyone, be generous with your anointing, be gracious with your anointing. The world needs to know the Resurrected Lord Jesus Christ. You know the Resurrected LORD? Good, now go and tell someone about Him. Share Jesus… Have an AWESOME Resurrection Sunday. Pease and Joy in Jesus.